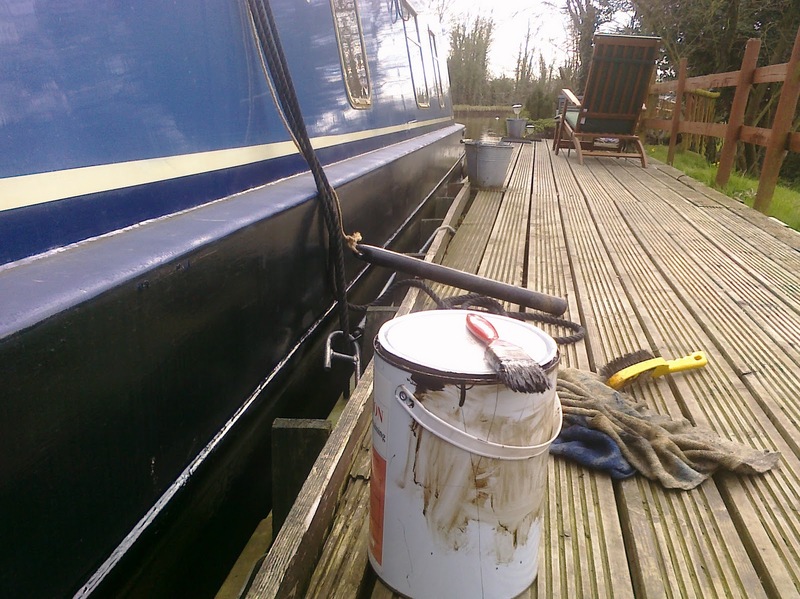 Readers of this post might also want to read this later post: Narrowboat Maintenance. Once again, this is for the information of those who are reading this and may be researching the costs of ownership and what work is required in routine maintenance. If you already own your own narrowboat, you will probably learn nothing here, as you will already be aware of the hull blacking process! 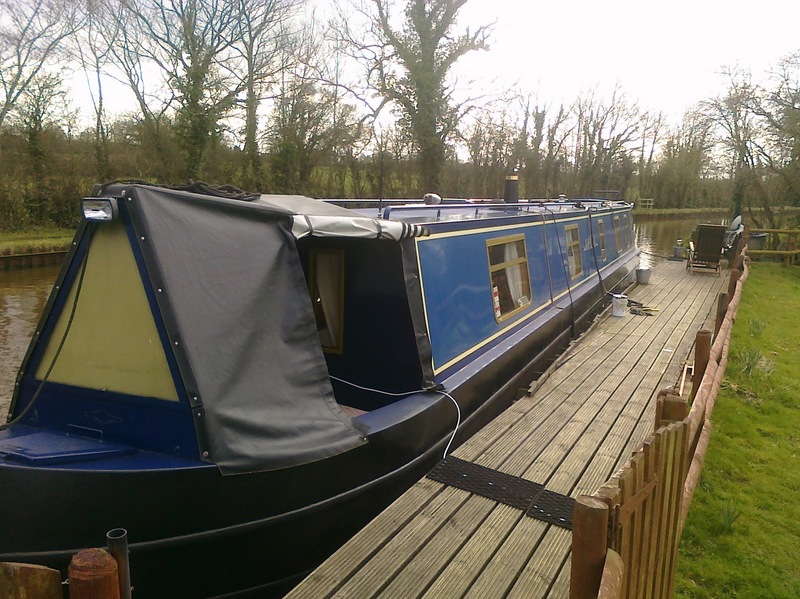 There are many costs involved in owning your own narrowboat, but some of these are obvious, such as license and mooring expenses, even engine servicing. However, sometimes other maintenance costs are overlooked, or those that potential owners may not even be aware of. If you own any kind of boat that spends its life immersed in water, be it of wooden, steel or glass fibre construction, then it will require, from time to time, to be lifted from the water and have its underside cleaned and repainted. The possible exception to this are boats with aluminium hulls, but I am going to deal with hulls made of steel here, which is the favoured material of the modern narrowboat built for leisure use. A modern steel narrowboat starts its life as a bare steel shell, which from new, as it exits the fabrication shop, will be coated with all sorts of impurities such as mill scale and welding residue. This will, (should), be blasted clean before its initial coatings of paint are applied, referred to as hull blacking. Once in use, this paint finish will have to be renewed from time to time in order to preserve the integrity of the hull and give it its maximum possible life expectancy. There are however, different kinds of paint to consider, and once in the maintenance cycle, different methods of actually getting the boat out of the water to do the job. For use on steel boats, there are two or three main types of paint, a modern, single pack vinyl tar paint known as "comastic", various brands of two pack paints, or a more traditional, but less resilient, bitumen based paint of various brands. If the boat is painted with comastic or one of the available two pack paints, it is said to be able to last longer between repaints than the standard bitumen, and are more expensive products. But, importantly, they can't be used over an existing bitumen finish. If you wish to use comastic over an existing bitumen based paint finish, then the hull will first have to be blasted clean of all the old paint, and started again from clean steel. An easy way to check what sort of paint is already on your hull is to soak a rag in white spirit and rub it vigorously on the blacking paint. If a black residue is transferred to the rag, it is probably bitumen. It is advisable, if buying your own product, to always read the application properties on the tin, before purchasing, and subsequently applying to the hull. I would say, however, that most users opt for the cheaper option of using the bitumen paint, which involves regular removal from the water, say every two years, to re-apply. There are also different methods used to actually get the boat out of the water. These could be, dry dock, where the boat is floated into a chamber and then the water is removed. Craning is another method used, but can be expensive if the yard has to hire machinery to do the job. Another method is hauling out on a slipway dolly. This is the method I opt for. The boat is floated over a dolly on a slipway, hauled out and then taken to a suitable covered area where the cleaning and painting can take place. Costs can be minimised by doing the cleaning and painting on a DIY basis, but it is usually an unpleasant task, that involves first a powerful jet wash, then a scrape and a wire brush to remove all loose material, finished with at least two, better three, coats of paint, with perhaps an additional coat around the waterline. The boat is then left for 48 hours before being returned to the water. A common misconception when talking of hull bottom blacking is that the base plate is not usually included, it is usually only the sides, usually below the first rubbing strake. The reason for this is that it is said that the base plate, being so far under water, does not have sufficient oxygen to complete the elements needed for rust to form. Also the paint will probably be worn off in a very short time in future use, as the boat scrapes the bottom of the canal in places. Some people, however, pay the extra to have the bottom done. Whilst the boat is out of the water, the anodes that are welded to the hull are also checked and replaced if necessary. These are there to act as sacrificial items, made of magnesium for fresh water use. They will rot away if there are any galvanic currents set up around the boat, instead of the more expensive to replace or repair hull and running gear. A quick check may also be made to the rudder and shaft bearings for play. So, what are the costs involved? There obviously will be a cost for getting the boat in and out of the water, but if you then do the job of painting it yourself, that will be it except for materials. Standard bitumen hull blacking paint currently costs around £25-£30 for 5 litres, and approximately 20 litres will be needed for an average 58 foot boat. If anodes need renewing, these are approximately £50 each for a 3-4kg item, and there are usually 4 on the hull. We have the boat lifted, cleaned and blacked professionally at a local marina every two years. In September 2009 the total cost was in the region of £500, we didn't require anodes. However, I also keep a 5 litre tin of my own paint which I use to touch up the scars that are inevitable every time we take the boat through the narrow locks of our cruising area. I also completely repaint the sides of the boat down to the waterline annually, between the full out of the water treatment. This is what I spent this weekend doing. The weather was good, the fresh water tank was low, lifting the bow, and the black water tank was full, giving a slight list to starboard. Once one side was complete, we took the boat to the marina to have the black water tank pumped out, (£15), then returned to the mooring the other way round, where I finished the other side. I use hammerite smooth black enamel above the first rubbing strake. We will soon be ready for a relaxing summer! Hello, we are holiday narrowboaters but have been bitten by the bug badly. Just about to buy our own boat so any information regarding ownership is very helpful. This information was great. Just enought detail to make sence and very well presented. We will save your site for future. I am currently looking into buying a narrow boat. At the moment it's just in the planning and costing stages of what it will cost to run one as a live-aboard. Just the information I was looking for about blacking. Thanks. Much of the information you will need about the costs of narrowboat ownership can be found here: http://canalrivertrust.org.uk/boating/licensing the link I have given is to the licensing section, the rest of the website holds much more general info. Unless you intend continuous cruising as a live aboard, you will also require a mooring, and here is a link to a marina's fees just for info:http://swanleybridgemarina.com/pricelist.htm If you intend living on a mooring, these are few and far between, and are much more expensive. You will also need a Boat Safety Scheme Certificate on any boat over 4 years old, and then every 4 years afterwards. Look at this as the equivalent of a road vehicle MOT. The cost varies, but is around £150, depending on the surveyor you choose. Then there is the annual service, or approximately every 100 hrs engine use if you are a live aboard, again varies between marine engineers, or DIY if you can. The only other annual cost I can think of here is insurance, which is a requirement of the navigation authority. This depends on size of boat, and other factors, but ours comes in around £130. After that it will just be fuel and maintenance costs as things break down. hi there, great little blog, early days for me just yet but I'm weighing up ALL purchase options, do you or any other readers have any idea it is to actually 're-plate' the hull of a 45/50 footer. You might also try posing your question here: http://www.justcanals.co.uk/ a place full of knowledge on all aspects of canals and boating. Hi Geoff. The following is completely my own opinion, and may differ from that of others. Personally, I would not buy a re-plated narrowboat - but that is only because I could afford to buy one that didn't need it, and with plenty of time left before it was likely to. Now I own one, I intend to keep it, and sooner or later it will require re-plating, which will be shown up on a condition survey that is required by insurance companies once a steel boat reaches a certain age, (remembering of course that any purchase should have a survey completed before you hand over any cash). In my own case, it will then be a case of choosing a reliable company who has gained experience in this kind of work, and then re-check the hull condition with my own surveyor once complete. If you intend to buy a narrowboat with a re-plated hull, the reason may be that the boat in question lies within your own budget. As such, providing the boat passes inspection by a qualified surveyor before purchase, with reports on current hull thickness etc., then I would have no hesitation in going ahead. It would certainly be more cost effective to buy a boat with the work done, than have to pay for it yourself a year or two down the line. I hope this helps with a decision. Readers might be interested to know that even with my own vigilant hull maintenance regime which was completed bi-annually at a local marina, our boat was actually seriously damaged while in the care of that marina, and during the routine maintenance of grit blasting and blacking. They had been given the task of completing this maintenance year on year without my direct supervision, and it later transpired that they had not warned me of the need for further investigation into the effects of galvanic corrosion that on the last occasion resulted in the hull being holed, and the boat being sunk within their marina and while in their care. Further issues with insurance, (or the lack of cover that transpired only after a claim was made) and the marina's refusal to provide their own insurer's details until a settlement on my own had taken place, resulted in the loss of our boat. Never never trust any third party to do work to a suitable standard. They must always be supervised to your own satisfaction or better still - DIY. An afternoon at ITV studios, Manchester. Visit to Wigan Maternity Ward. The baby boy arrived, safe and well! Three weddings, a trip to London and a baby boy! How do I calculate my energy requirements? Our own lambing live in Nantwich. Why not take a canal hire boat holiday?